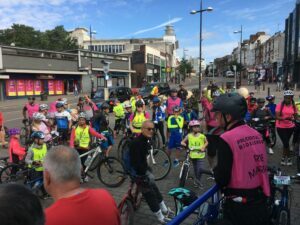 Bromley’s Cycling Community descended on Norman Park for a day of cycling fun and events and to cycle the 5760 miles to Rio de Janeiro in the ‘Road 2 Rio’ Challenge supporting the British Athletes preparing for the Olympic Games in August. The Ride to Rio Challenge – to ride the equivalent distance from London to Rio in 4 hours – was warmly praised by Bromley’s new Mayor, Cllr Ian Payne. 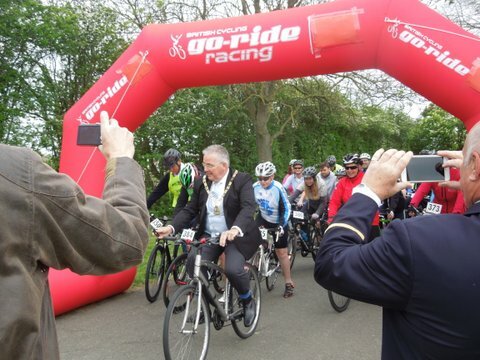 The Mayor then bravely led the riders off on a circuit of the park despite being being dressed in morning suit and chain of office – Chapeau to the Mayor. Riders young and old, experienced and newbies pedalled a total of 6779 miles, beating the target distance by over 1000 miles.